The permanent exhibitions at Amsterdam’s Rijksmuseum show a dazzling selection of art and objects from all over the world. The grand brick structure is imposing and proud, having recently re-opened after a massive overhaul of the interior and permanent exhibits. Its central courtyard is open and modern which beautifully contrasts its classical construction. In addition to having one of, if not the best, collection of paintings from the Northern Renaissance period, the medieval exhibits allow visitors to view some of the best-preserved panels and unique objects in the world. The oil paintings on panels are absolutely breath-taking. When I considered that these are the ones selected for display, I had a moment of shock when I thought about what else must be in storage! The panels on display represent an amazing collection, and amazing quality. The condition of these fragile pieces is remarkable. I am not qualified to comment on any conservation or renovation work on these paintings, but they look almost as if they were painted a few years ago rather than a few hundred years in the past. One particularly memorable piece was the 15th century “Mary Magdalene” by Carlo Crivelli (tempera on panel). The delicacy of the hands and the facial features combined with the luxurious detail of the clothing and draping kept me standing in front of this piece for nearly 15 minutes. This was just one example of the large and impressive medieval paintings on display. Another category manifest in many forms and media was sculptural pieces and carving work. This included 11th century ivories, a decorated hunting horn, a symbolic antler shield, intricate prayer nuts, and religious figures. The 11th-12th century antler shield was a highlight of the decorative objects. This emphasis is due in part to the method of display: the piece was suspended in a high case so visitors can get a 360-degree experience. Its unique nature, relatively large size, and prominent display really made it stand out as a special feature of the gallery. Nearby, three statues from the monastery at Mariënwater were a great example of walnut carving with intact polychromy from c.1470 a.d. I’ve seen some great memes with song lyrics combined with classic art work, and I couldn’t stop singing ‘Single Ladies’ to myself when I saw these three carvings. Saint Barbara looked ready to dance! Nearby, a 16th century carving of Saint Ursula with her handmaidens was ready to provide some back-up dancers. Moving through the medieval galleries, the visitor is treated to other fantastic examples of medieval craftsmanship. A display full of aquamaniles and metal candle-holders is across the room from a, uh, cheeky chess set and complemented by wooden and bronze models of 10 weepers from the tomb of Isabella of Bourbon. 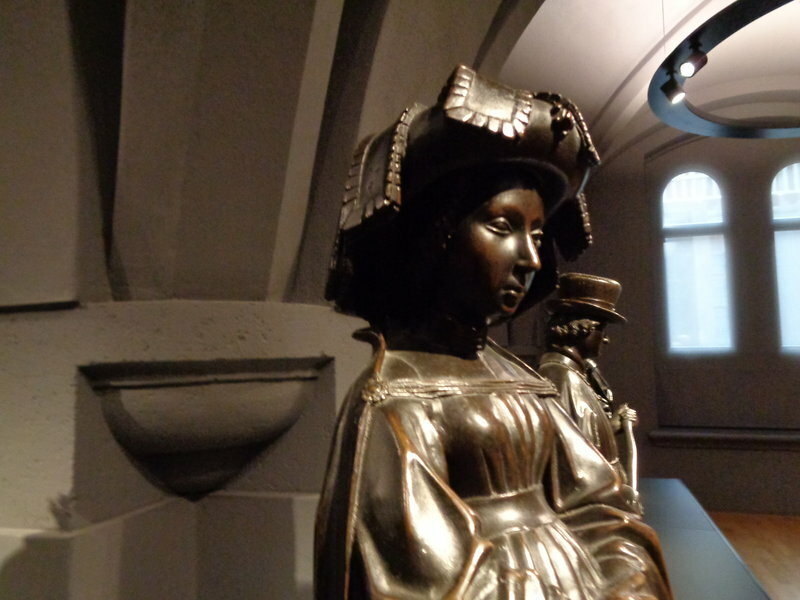 The figures show individual 15th century fashion choices including an assortment of fantastic hats. This display of delectably delightful pieces continued into a gallery of firearms and weapons. See below for a quick video tour of this exhibit space! The sheer size of some of the “hand-held” firearms was astounding, and the detailing on some of the flintlock pistols showed clear signs of wear through use. Two pieces in particular stood out in this encyclopedic gallery: a double-flinted pistol, and a powder case made out of a tortoise shell. Really, a tortoise shell. It’s fantastic. The double-flint pistol was a really special object; it literally would provide double the fire power! This wide-ranging display was typical of exhibits at the Rijksmuseum: large, beautiful displays of jaw-dropping objects paired with labels in Dutch and English in seemingly endless galleries. The galleries were categorically grouped, with medieval art displayed together and 19th century paintings in other galleries for example. This overall flow didn’t tell a story and many of the exhibits lacked context. Outside of the medieval galleries where I could provide context myself, I didn’t get as much information about the cultural or temporal values which produced the art on display. The exhibitions at the Rijksmuseum are still definitely in the do-not-miss category but if you want the backstory on the art, prepare by bringing a guide, take a tour, or remember your smartphone. This museum is a history lover’s dream: it has at least one (and usually more!) of everything and it will represent top quality. The labels are in English and Dutch and the open galleries are easy to move through. Check your bag at the free check counter and you’ll receive an engraved metal tag for retrieval. If you find yourself in Amsterdam, make sure you make the Rijksmuseum and its adjacent park a priority!